The Main Center of Air Traffic Management of the Kyrgyz Republic - is the main authority of the State engaged in direct interagency planning and coordination of all activities in the airspace of the Kyrgyz Republic, as well as the procedure for its use. It is designed for air traffic flow management, monitoring of compliance with safety and regularity of air traffic. MC ATM KR operates its activity on coordination, planning and management of airspace use of the KR, as well as other airspace where the responsibility for air traffic control defined by international agreements. The staff of the Civil Sector of Main Center of Air Traffic Management consists of traffic controllers having a valid certificate of air traffic controllers of Civil Aviation, possess knowledge of English and computer. Other units of planning and air traffic management of civil aviation. Participation in conjunction with departmental units of air traffic services and aviation search and rescue services in helping aircraft distress or in distress and to provide flights undertaken with natural disasters. The Civil Sector is responsible for state regulation and using of airspace – in operation flights by aircraft on airways and domestic air lines, airports (civil aerodromes), and in coordination with the Military Sector, in flights operation by aircraft is out of air ways and domestic flights, including straightened routes and in aviation works operation. 1) The preparation and provision of daily planning, the control of air traffic in the airspace of the Kyrgyz Republic and to the full depth of flight, bringing the daily plan changes to the Military Sector of the Main Center of Air Traffic Management, air traffic services centers, command posts of air defense forces of the States concerned, and an analysis of the daily plan. 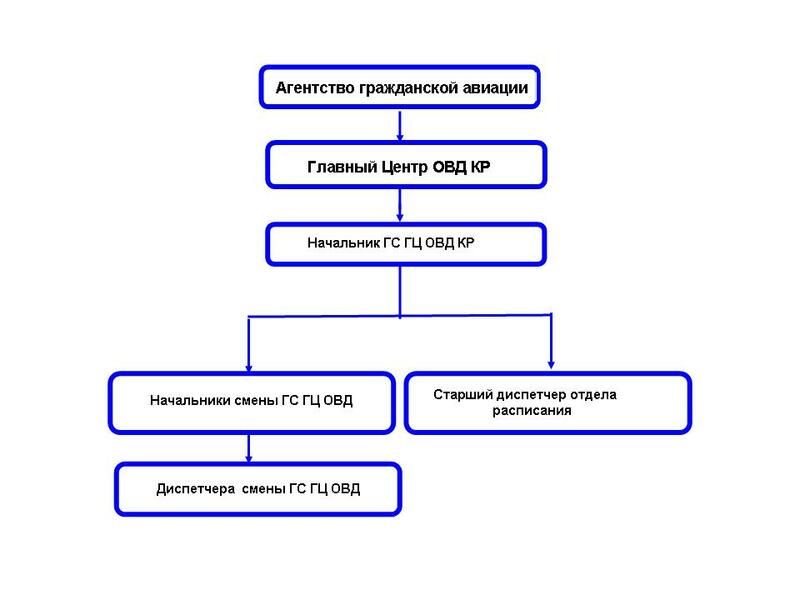 2) The planning and organization of aircraft’s flows , flying on airways beyond the area of ​​responsibility of the Main Centre of Air Traffic Management of the Kyrgyz Republic, as well as the redistribution of these flows in changing flight tasks, air, meteorological and ornithological situations. 3) The provision of activities requiring special organization of airspace use (lettered flights, controlled aircraft and etc.) in accordance with the daily plan CS MC ATM KR. 4) The provision of international flights of aircraft in their part concerned. 5) The coordination with the Military Sector of the Main Center of Air Traffic Management re-routing and changing the flight altitude of aircraft (AC) in cases of avoiding area with dangerous meteorological conditions, changes of flight plans or direction of aircraft to alternate airports if necessary to go out off the Airways or Domestic Airways. 6) The coordination with the Military Sector of the Main Center of Air Traffic Management of the Kyrgyz Republic the usage of straightened routes of airways or domestic airways, and additional flight levels (altitude) in the airspace of (AS) areas of responsibility and beyond. The monitoring and coordinating the activities of air traffic services centers on the issues of airspace use. The control of readiness of main and alternate aerodromes to accepting aircraft and the work of en-route radio technical equipment according to the daily plan, as well as the taking measures for the replacement of these airfields and facilities in the event of their failure. The coordination of requests for airspace use of the Kyrgyz Republic through the Ministry of Foreign Affairs, Ministry of Defense and with the services of aerodromes, as well as the issuance of permits for the airspace use of the Kyrgyz Republic and landing within the country's civil aircraft.